A cherry angioma is a noncancerous (benign) skin growth made up of blood vessels. Cherry angiomas are fairly common skin growths that vary in size. They can occur almost anywhere on the body, but usually develop on the trunk. They are most common after age 30. The cause is unknown, but they tend to be inherited (genetic). Your health care provider will look at the growth on your skin to diagnose a cherry angioma. No further tests are usually necessary. Sometimes a skin biopsy is used to confirm the diagnosis. Cryotherapy is a method of superfreezing tissue in order to destroy it. This article discusses cryotherapy of the skin. Cherry angiomas are noncancerous. They usually do not harm your health. Removal usually does not cause scarring. Patterson JW. Vascular tumors. In: Patterson JW, ed. 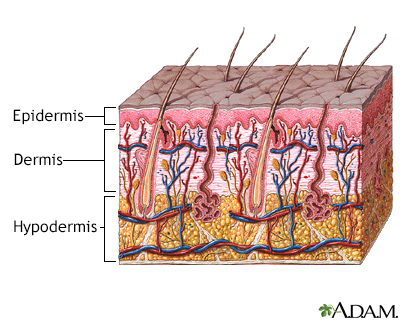 Weedon's Skin Pathology. 4th ed. Philadelphia, PA: Elsevier; 2016:chap 38.